Hollywood has a tendency to run a good idea into the ground, especially when it comes to animation. Five Ice Age films succeeded in transforming the endearing into the irksome. 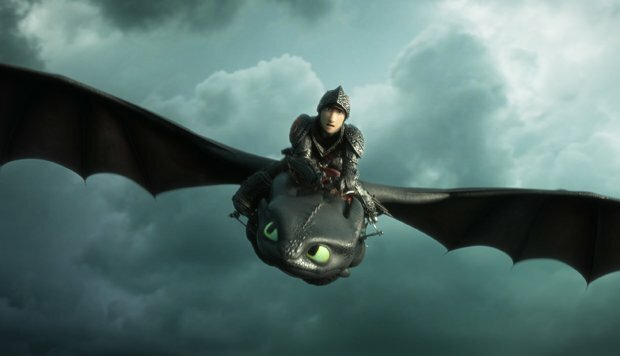 It seems a wise move to end the How to Train Your Dragon series at a point when it gives every appearance of running out of steam. The Hidden World is all about growing up and moving on as Viking chief Hiccup (voiced by Jay Baruchel) assumes growing responsibilities, whilst his trusty dragon Toothless discovers true love. Hiccup has heard a mariner's myth of a place at the end of the world that could be a safe haven where humans and dragons could live in perfect harmony. He sees it as his duty to lead everyone to this promised land. Night Fury dragon Toothless, meanwhile, has become a lovestruck puppy with the discovery of a soulmate in a Light Fury dragon. Naturally, there is a dastardly villain determined to spoil everyone's fun. Relentless dragon hunter Grimmel is voiced by a restrained F Murray Abraham with a haughty manner and a Bela Lugosi accent. It is a game performance but the character still fails to impose himself on the proceedings as the embodiment of evil. A busy plot tends to undermine the central bond between Hiccup and Toothless. There is simply too much going on and many of the uninspired secondary characters feel like a distraction rather than an addition. What impresses most is the unshowy artistry from the animation department, as a dragon's wing slices through a tumbling waterfall, a gentle breeze catches the down on Hiccup's face, or a swashbuckling rescue mission unfolds in a shroud of mist and haar. The Hidden World eventually reaches a satisfying conclusion but it doesn't always soar along the way. General release from Fri 1 Feb.